In “Judge, Jury, Executioner” we fully see for the first time the new role Daryl is taking within the group. The episode opens with him torturing Randall for information. There is no indication of enjoyment in this repugnant task for Daryl, but instead a willingness to do what is necessary to protect the group, which he has come to view as a surrogate family despite all his protestations. Trusting him with this task shows Rick’s increasing trust and reliance on Daryl to get things done. After all, Rick is waiting in camp to base his entire decision of Randall’s execution on what Daryl has to say. This lets us know several key things. Firstly, Rick is confident in Daryl’s abilities to get the information out of Randall without going too far and killing him. It would be easy to be caught up in the violence and cause mortal damage. Conversely, if he did not have the stomach for the calculated infliction of pain, the prisoner would gain the upper hand and ruin any chances of getting real intel on the hostile group. That Rick is unable to do this task himself is an interesting thing. Despite his insistence in “18 Miles Out” that he is no longer a good man, Rick shows conflict throughout this episode between the police officer he used to be and what he has to do now to survive. Shane has proven to be capable of violence, but Rick did not look to him for this. Secondly, Rick knows Daryl will not be fooled by disinformation or be suckered in by a sob story. We have seen from the beginning that a lot of people underestimate Daryl’s intelligence, whether due to his accent, appearance, or “redneck” background. However, as the show has progressed, it has become quite apparent that Daryl, while socially awkward and emotionally stunted, is very observant of others and we see in this episode especially that he knows a lot more than he lets on. Daryl was never fooled by Shane’s rather weak story of how Otis died and knew before anyone else that he was not to be trusted. That he did not share this information with anyone reinforces how isolated he has felt from the rest of group. Lastly, and most importantly, Rick trusts that Daryl will be honest. Daryl lays out plainly exactly what kind of threat this other group is and what will happen to everyone should they attack. If Daryl was really some psycho he could have lied or left to join Randall’s people, but Rick obviously knows that Daryl is not that kind of guy. The expressions on the faces of everyone else in camp when they realize how Daryl acquired the information show how little they understand his motivations and it is a slap in the face to Daryl, yet again. However, Rick is not the only one to show Daryl a new level of respect in “Judge, Jury, Executioner”. When Dale is going around trying to convince others to keep Randall alive, the first person he goes to see is Daryl. Instead of launching right into a spiel, Dale expresses concern and conviction that Daryl is more important than he believes himself to be. Despite claiming to want to get away from everyone, Daryl listens and does not become combative with Dale. Carol is the only other person that has said something like this, but Dale takes it a step further by saying that he is in fact a better man than Shane. 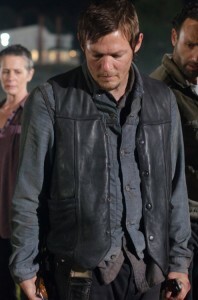 Daryl’s frustrated, bitter insistence that he does not have Rick’s ear, that Rick only listens to Shane, shows how much Daryl really likes and respects Rick. He wants to be that right-hand man, but feels inadequate and shunted to the side. He desperately wants to be part of the group, but by saying it is “broken”, exhibits the fear that it will turn out to be the disaster his real family was. At the end of the episode we see Daryl’s true colors and they are beautiful. When Dale screams, Daryl does not hesitate a second in sprinting to his aid. Daryl literally throws himself at the Walker to get it off of Dale. 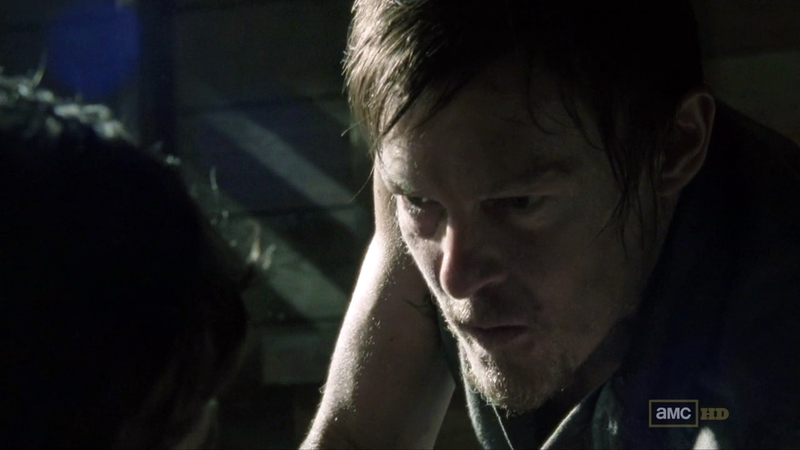 There has never been so much emotion towards another of the group from Daryl as in this scene. Jumping and yelling for the others to come and help, he drops to his knees beside Dale and says an agonizing “Hang in there, buddy”. It is then we know what a profound effect Dale’s earlier words had on Daryl and how much he truly views the group as his people. The angel wing vest has never been more appropriate than at this moment. Daryl is willing to be the angel of mercy in place of Rick, willing to take on the burden of putting Dale out of his misery when no one else could. The compassion and sacrifice Daryl exhibits is heartbreaking. This is the turning point. There is no denying now that Daryl, though rough around the edges, shows the qualities of a genuine leader, a much more fitting second-in-command to Rick than Shane has ever been, as we once again see Shane not step up when the times call for a true leader to do so. 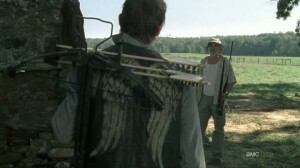 It is interesting to note in the trailer for “Better Angels” that Rick is taking Daryl to set Randall loose, rather than Shane. Despite what Rick said to Lori about Shane no longer being problem, he obviously trusts Daryl more to have his back on this issue than Shane, considering that both Daryl and Shane wanted Randall dead. In the coming episodes, I fully expect Daryl to assume more responsibility and become Rick’s go-to guy. How this will play into Shane’s power struggles remains to be seen.